Along with a few others, I recently had the opportunity to visit one of Ohio's best remaining fens, in west-central Ohio. This one isn't open to the public without a permit; the habitats are just too sensitive for unregulated traffic. But as always, I took my trusty Panasonic along for the ride, and following is a brief pictorial travelogue of our foray. The view into the fen, from a high and dry glacial esker that abuts the wetland. This is one of Ohio's more breathtaking pieces of scenery, and this vista is jam-packed with interesting biodiversity. The dry gravelly slopes are populated with scattered jumbo Bur Oaks, Quercus macrocarpa, underlain by a stunning show of prairie wildflowers. Strong artesian springs burst from the toe of the slope, forming the fen. Fens are highly alkaline wetlands with strong sheet water movement, and permanently icy root zone temperatures. Couple those factors with the high alkalinity and we've got an environment that only specialized flora and fauna can tolerate. The open area above is called a marl flat, and it's the wettest most alkaline part of the fen. Needle Beaksedge, Rhynchospora capillacea. Sedges are the dominant vegetation in fens in terms of biomass, and this specialist is the first to jump into the open marl flats and start the long process of ecological succession. The beaksedge will eventually be replaced by ever woodier plants, and someday - long after we are gone - its habitat will be forest. Few plants are showier than this member of the rose family. Queen-of-the-prairie, Filipendula rubra, looks like puffs of pink cotton candy floating above the meadows. In contrast to gaudy rosaceous extroverts, the elfin Limestone Savory, Clinopodium arkansanum, hides among the bases of moist hummocks. It takes a sharp eye to spot the tiny mint, but like so many of our miniature plants it is exceptionally showy upon close examination. Crush a leaf and you'll be treated to one of the world's most aromatic fragrances. Interesting and rare beasts stalk the fen. This is one of our scarcer dragonflies and a pipsqueak of a predator, the Seepage Dancer, Argia bipunctulata. An odd lily in need of more study, the False Asphodel, Triantha glutinosa. It's stem and inflorescence are beset with glandular hairs and so sticky that small insects are stuck fast and perish. Is this the beginnings of the evolution of carnivory? Insect-eating is not known in the lily family. Another beautiful lily of the fens, and don't go eating this one. It is Wand Lily, Zigadenus elegans, sometimes known as Death Camas. It's bad news for the hapless consumer. Prairie plants abound in fens, after all, these wetlands were essentially the wettest parts of the prairie. These luminescent beacons are the flowers of Prairie-dock, Silphium terebinthinaceum. One last look back at the fen meadow. This small site harbors some of the richest biodiversity of any Ohio habitat. Places like this are treasures, and we should do everything in our power to protect them. A great many people were indoctrinated to the charms of the katydid world via "Pinky", the beautiful creature above. A very rare pink color morph, she was exposed to probably over 200,000 people in various media, and many through direct contact as she was exhibited here and there. Today would have been her first day at the Ohio State Fair and had she made that gig and lasted for the fair's duration, tens of thousands more would have come to know her. But it was not to be. We knew that a parasitoid of some sort was at work, and its larva was within Pinky. Today, when I arrived at the office and went to check on her, she was lying on the terrarium floor, expired. Tragic is this may be, it opens up another learning opportunity, this time into a little known, horrifying, but pervasive part of nature. WARNING: some of the shots that follow are graphic autopsy photos of the pinkster being subjected to CSI-like study. But it is just a bug, and they aren't THAT graphic! Entomologist Dr. Norm Johnson in his lab at Ohio State University. Norm was good enough to take time from his schedule to open Pinky up, and see if he could ascertain exactly what happened. He did, as we'll see. Norm is one of the world's top experts on parasitoid insects, especially wasps. The other man is Skip Trask, who was shooting the operation for Wild Ohio TV. With the help of a dissecting scope, Norm carefully opened Pinky up so we could see what was within. A bit gruesome, perhaps, but instructive. This photo was taken immediately after Norm identified the cause of death and isolated the attacker. That large grublike thing within Pinky's abdomen is just that - a fully grown larva of a tachinid fly. This is an enormous, diverse and abundant group of parasitoid flies, and we don't know what species it is exactly, but more about them in a bit. Here's the grub, pulled out for better viewing. The two black spots are essentially breathing ports, and it'll press those near an opening in the katydid's body to get air. Probably, the small hole noticed by Wil Hershberger and shown in this post is what the grub was using as an air port. Here you can see the scale of the grub as compared to the katydid, and the latter is not a small insect. By the time she expired, the fly larva had consumed nearly all of her innards. I've said this before and I'll say it again: if you are a fan of reincarnation, don't get yourself brought back as any type of insect. This sort of demise is extremely common in the insect world; probably most individuals of many groups of insects are attacked and killed in this manner. And there are parasitoid insects that attack other parasitoids - no one is safe! 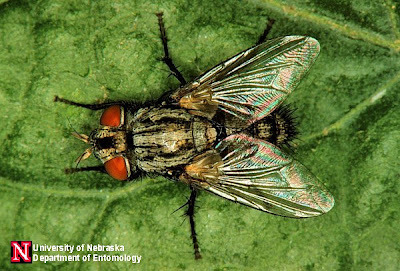 One of the scores of species of Tachinid flies, courtesy the University of Nebraska Department of Entomology. You've probably seen these things. They often look like especially coarsely bristled house flies. And they are everywhere. Their modus operandi are varied. Some tachinids lay an egg directly on the host insect. It hatchs and the tiny grub bores into the insect, and eventually grows to the point of what we saw in the photos above. Other flies deposit a tiny grub directly on the host, while others lay an egg near areas frequented by suitable hosts, and the grubs make their way to the victim. Still other tachinids lay eggs on plants that are likely to be eaten by insect hosts, and thus get their offspring into the victim in that manner. Ah, nature. Life can be cruel and seemingly horrifying once one learns some of the nuts and bolts of how certain things operate. But these sort of relationships have been forged over many millions of years, and are an integral part of the ecosystem whether we like it or not. But I'll miss the pinkster. Here's hoping we find another next year! Thanks again to Jan Kennedy for finding Pinky, and Cheryl Harner for helping to care for her. I finally had the opportunity to work with the now famous pink Amblycorypha katydid known as "Pinky", and get some respectable images. Scroll back to a few earlier posts that I made if you want to learn more about it. Above, our star poses on the leaf of a native agrimony, Agrimonia gryposepala, which provides a nice backdrop for her nearly preposterous pinkishness. Little did Jan Kennedy know, I suspect, what a sensation this bug would become when she found it in a meadow at Killdeer Plains Wildlife Area. Wil Hershberger, world class authority on singing insects and the Orthoptera, and a heckuva nice guy should you ever get the opportunity to meet him. He and Lang Elliot produced the book The Songs of Insects, and it is sensational, as is the CD of sounds that is included. Look closely on his hand and you'll see our pink protagonist, hanging with the Man himself. Despite many years of active field work and specific searches for all of eastern North America's singing insects, Wil had never seen one of these pink katydid forms. Until yesterday, that is, when he made the trip to Columbus from West Virginia to meet the pinkster. Wil is also an expert photographer and got images that are dazzling, as well as video footage. A short video of the katydid, surrounded by fawning paparazzi. As the little bubblegum-colored beast can't yet fly, we had few qualms about posing her outside in natural vegetation for photo ops. She's a tremendous jumper, though, and if provoked can outleap Superman. But, I learned a katydid herding technique from Wil. Should you wish to prod one into a new more photogenic pose, don't use your fingers. They react badly to the oils and salts in your skin, and will take a flying leap. Rather, just find a nice feather if one is handy, and push them around with that. Her eyes are crazy, sort of a bluish-white marbled color that contrasts interestingly with the outrageous body coloration. Note the short wing buds, just aft of the armored plating known as a pronotum. Males have a file and scraper system on the forewings which they rub together to produce sound. Fossil evidence of Orthopterans with the the "singing" parts preserved dates back 360 million years, making these insects likely the first organisms to evolve the ability to intentionally create sound. Today, Pinky began to show signs of molting, and I am curious to see what she looks like tomorrow morning. We are hopeful all goes well with her and she successfully molts out of this last instar stage and into her final adult form, replete with large wings. A bit of potential bad news. Really bad news if you are the katydid. Wil noticed a slight mark that appears to be the incision wound caused by a parasitic wasp. You can see it by looking on her lower body, just in front of where the base of the curved swordlike ovipositor joins the body. The wound looks like a slight pinprick, and if it is indeed the handiwork of a wasp, it's curtains for Pinky, unfortunately. A great many insects are attacked by parasitic wasps, which use stingerlike ovipositors to inject eggs into the victim's body. There, the eggs hatch into little grubs, which begin to eat the host alive. Finally, like something out of a horror movie, the grubs burst from the hapless host's body, and by that time it is nearly dead. Nature is full of these seemingly horrific relationships, but that's just how it goes. Even if this is Pinky's fate, she will have been an extraordinary ambassador for insects and the natural world. Her next act is the Ohio State Fair, where she'll be displayed at the Natural Resources area. Should you find yourself down there, stop by and check her out. One last short vid, showing the curious slow jerky gait that katydids move by; their walk resembles that of an American Woodcock. You may remember the bizarre flaming pink katydid that I blogged about recently. Well, I hope this chirper doesn't get too big for her britches, given all of the attention she's getting. The katydid just returned from the Midwest Native Plant Conference in Dayton, where she was fawned over by perhaps 200 people over the weekend. Tomorrow, she's going to be interviewed and filmed for a TV program, and possibly by a local TV station. Wil Hershberger, co-author along with Lang Elliot of the fantastic book The Songs of Insects, will be visiting my office to photograph "Pinky", as she's come to be known. And last Friday, the Columbus Dispatch newspaper plastered a big bright photo of Pinky across the front page of the Metro section, accompanied by a wonderful article written by Erin Dostal. The pink katydid has turned out to be a great ambassador for nature, and is undoubtedly stimulating lots of people to think about the wonders of the natural world. I would say that, by the time her career in the limelight ends, over 200,000 people may have been exposed to the brilliant little wunderdid. Read on for Erin's Dispatch article, and you may also find some of the comments about the katydid article that were posted to the Dispatch's website interesting. You can see them HERE. She's pink, personable and a smash-hit summer singer. She's Pinky the katydid. "I was floored! I couldn't believe it!" 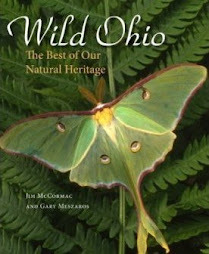 said Jim McCormac of the Ohio Division of Wildlife. "This is pink as pink can be." Jan Kennedy of Mansfield found the pink katydid while walking through the Killdeer Plains Wildlife Area in Wyandot County on Sunday. "It was like finding a new toy," said Kennedy, who chose the Pinky name. "To me, it's a total treasure hunt." Kennedy and friend Cheryl Harner of Crestline were participating in an Ohio Certified Volunteer Naturalists workshop. The women aren't experts, but they are nature enthusiasts. "It's kind of like finding a pink elephant," Harner said. "Something like this fills even the most jaded person with a sense of wonder." Harner is keeping the katydid in a terrarium. It will be returned to the wild on a date yet to be picked. McCormac, who was also at the workshop, said photos of Pinky have "gone viral" since he posted them on his blog and his Facebook page. Bubblegum-pink katydids are rare: one in about 500. Katydids also come in blue, yellow and -- most commonly -- green, said Wil Hershberger, a West Virginia nature photographer and the author of The Songs of Insects. The green ones mimic leaves, but the pink ones stand out and make easy pickings for predators, Hershberger said. "Birds would take that out in a hurry." The katydid gets its name from its song, said Dave Horn, a retired professor of entomology at Ohio State University. It sounds as if it's saying "katy-did-katy-did-katy-did." The pink color is brilliant, Horn noted. "You know the girls in Grease? The pink ladies? The girl who dyes her hair? It's like that." The color could allow the bug to hide in flowers, Horn said. McCormac, an avian-education specialist, said he heard that the color might be so shocking to birds that they won't eat it. He'll take Pinky to the Midwest Native Plant Conference at the Hope Hotel and Conference Center in Dayton on Saturday. Hershberger sees the bug as an opportunity to showcase the importance of conservation. As habitats disappear, so do cute, pink katydids. The dark of night is underrated for fun in the field. It's black out there, true, and harder to see stuff. But there are ways around that; they're called flashlights. I think many people may shy away from roaming about after dark because people generally have an inherent fear of a night unlit by lots of artificial candlepower. Scratches, wheezes, snuffling and shuffling, and the occasional roar or howl build in our minds until they become the bogeyman or perhaps Bigfoot himself. One way around the fear factor is to go out in bunches, as in the photo above. This was our nocturnal foray last Saturday night, as part of the same workshop that produced the incredible pink katydid. Led by Dr. Dave Horn - center, facing camera, white short - our primary quarry were moths. Some success was met with. What a beauty! We were thrilled to dredge up this Virgin Tiger Moth, Grammia virgo. There are several species in this neck of the woods, and perhaps you've seen one. They are quite distinctive as a group, although some species can look very similar. This one is a jumbo; the biggest of the lot. When on greenery such as above, they stick out like sore thumbs. But, while at rest on more desirable dead vegetation they'll be pert nigh near impossible to detect. But wait! The Virgin Tiger Moth has a trick up its scaly little sleeves, should a titmouse get wise to it. If poked or otherwise prodded, the moth flashes open its wings, quickly revealing the universal danger code: RED. Be off, ye foolish titmouse, it is flashing, and if all goes well, the feathered invader is repelled and the Virgin Tiger Moth lives to reproduce others of its ilk. How a virgin moth reproduces was not satisfactorily explained to the group by Dr. Horn. Whoa! An Io Moth, Automeris io, one of my all time favs. This exquisite Saturniid moth flew in just as Dave was packing up his sheets and blacklights and we prepared to call it a night. The same theory as with the tiger moth is at play here. Predator invades Io's space, Io whips open those wings, predator is suddenly face to face with two terrible big glowing eyes, predator beats feet out of there. Dave told us of observations where chickadees would encounter an Io and get the evil eye treatment. "EEK" and back they'd flutter, but eventually glancing back to see what the eyed giant is doing. Well, the moth isn't in pursuit, so the chickadee would muster its courage and hop back for another probe. Eyes. EEK! But, each time this happened, the chickadee would be less frightened until the fateful encounter when it finally learned that the moth with the spooky eyes couldn't eat it. Chickadee scores plump fuzzy meal - Io's evolutionary eyespot advantage fails. I suspect that the Io eye flash does indeed work just fine and many instances, though, and startles would be moth-eaters enough that they back right off and get out of Dodge. Had to throw in this spectacular flying lemon wedge of a butterfly, the Cloudless Sulphur, Phoebis sennae. The white one is a Cabbage White, Pieris rapae, and the comparison demonstrates just what a monster the sulphur is. I had seen one fly by on Friday while we set up for the workshop, but none were spotted on Saturday. But low and behold, our group walked out of the building on Sunday, and there were two sulphurs on the ground and uptaking nutrients at a spot of muddy soil. First photos I've gotten of this one in Ohio, as they hardly ever seem to land. We're revising our opinion of the status of this largely tropical butterfly in Ohio. It was not long ago considered rather rare, and nearly absent some years. Not anymore. The last several years have seen many Cloudless Sulphurs appearing, sometimes in large numbers, and frequently attempting to reproduce. Steadily warming mean temperatures would seem to be a good hypothesis to explain their upward spike. The sulphurs created a hubbub. When our group spotted them, we yelled to the other groups, and soon nearly everyone had assembled. In the video above, photographer David Fitzsimmons gets down to eye level with the beautiful butterflies. You can see one of the Cloudless Sulphurs take to the air at the very beginning of the video. I've been looking forward to making this post, ever since I laid eyes on the remarkable, shocking beast that follows. Be prepared, and be assured that the images that follow are not faked in any way, shape, or form! If this was April 1 no one would ever believe me! Killdeer Plains Wildlife Area, Wyandot County. Legendary among Ohio's birders for the wintering concentrations of raptors, and big migrations of waterfowl that pass through. But Killdeer is prairie - the biggest and best remaining chunk of the formerly vast Sandusky Plains wet prairie that sprawled over parts of Hardin, Marion, and Wyandot counties. Nearly all has been turned by the plow and now sports lush stands of beans, corn, and wheat. Killdeer is still full of prairie plants, and a wealth of interesting fauna. Because of its diversity, we chose Killdeer Plains for an interesting workshop that was held over the weekend past. In partnership with the Ohio Division of Wildlife, the Licking County chapter of the Ohio Certified Volunteer Naturalists organized and executed what was essentially a nature camp on a high educational level. Many thanks to OCVN'er Rae Johnson for her leadership and heavy lifting in making this wonderful workshop possible. We limited it to about forty people, and had four separate tracks of study: birds, butterflies, dragonflies, and plants. 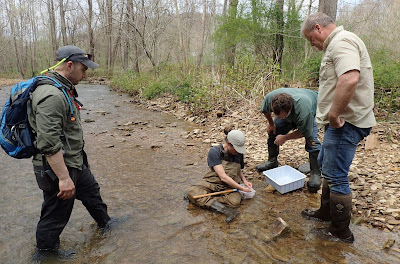 Some of the state's top scientists and naturalists graciously offered up their time to lead the courses, which were split between indoor programs and field trips. We had the likes of Dr. Dave Horn (butterflies and moths), Bob Glotzhober and Jim Davidson (dragonflies), Bob Placier (birds), and your narrator doing plants. Thanks to Roz Horn for snapping the photo above, of most of our group. It was a really great time, and with that many keen, knowldegeable eyes scouring the landscape you can be sure noteworthy critters will come to light, and plenty did. One creature shocked us into awed revery, though. It was a first for everyone, and God only knows how many centuries of exploration our group collectively contained. While out on one of the expeditions, Jan Kennedy spotted the very pink creature above. Yep, it is really that pink. Pinker than one of Liberace's jackets. Pinker than Pink. Pinker than a Richard Simmons tank top. Outlandish. And very rare. Fortunately for the rest of us, Cheryl Harner put the critter in a jar and brought it back so all could see. I can't even estimate how many photos were taken of this thing. All of mine were snapped indoors in David Fitzsimmons's photography rig designed for shooting insects on a white background. But the critter's whereabouts is still known - he has become a temporary pet - and I hope to have another opportunity to shoot her outside in vegetation under natural light. So, what is it? Well, it's a bush katydid. I'm not exactly sure of the species, but it appears to be of the genus Amblycorypha, and it may be the Rattler Round-winged Katydid, A. rotundifolia. It is a female, as can be told from the prominent upcurved ovipositor jutting from the end of the abdomen, clearly seen in the first photo. It is also a subadult, as the wings are not yet fully developed. There seems to be precious little information on the phenomenon of pink katydids, but they are well known as when one of them is discovered, it is likely to garner a lot of attention, and attract plenty of paparazzi. The genetic condition that causes the normal green coloration to become bright, shocking pink is known as erythrism. Bugs with this condition probably have a few molecules rearranged which utterly whacks out the normal color, creating this psychedelic beauty. Who knows what percentage of the katydid population is pink: one in a thousand? Ten thousand? A million? In any event, it's certainly not something one frequently stumbles upon. The primary reason a pink katydid is so shocking, I believe, is that animals are NOT supposed to be bright pink! Flowers, sure, there are plenty of 'em. But animals? Not. In fact, when sharp-eyed Jan first spotted the katydid, she thought it was fake. And who could blame her? Pink katydids spawn lots of interesting questions, and I wish I had answers. Is this just a complete genetic anomaly with no good reason for occurring? Is the erythrism stimulated by the presence of certain plant species? Are bright pink katydids more likely to be preyed upon be birds or other predators? What is the frequency with which this condition is passed on to future generations? 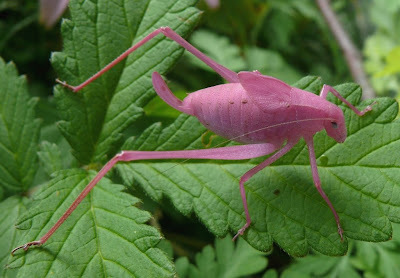 Are we going down an evolutionary road that will lead to fields of pink katydids in the future? Someone needs to study pink katydids! What a great Masters or PhD project. "Hey dude, what's your bag, research-wise, man?" "Oh wow, man, pink katydids, dude, like they're totally awesome, man" "Oh, radically awesome dude! Pink fluorescent katydids, how cool, dude". Yep, that's be a cool study subject bit good luck finding them! The mothman himself, Dr. Dave Horn, spearheaded a nocturnal foray on Saturday night focusing on moths and other nighttime insects. During the expedition, I heard the katydid above calling from the adjacent field. This is what a katydid SHOULD look like - nice and lime green. But this katydid is quite interesting in its own right, for it is the "counting katydid", more accurately called the Broad-winged Bush Katydid, Scudderia pistillata. Here's how they go: zeet...zeet zeet... zeet zeet zeet... zeet zeet zeet zeet... and so on. Go HERE to hear it yourself. Some of our party ventured into the field to find the beast, and it wasn't long before the katydid was spotted high atop a plant stalk, broadcasting his mathematical melody to all of the admiring ladydids out there. Ah, the wild world of katydids. Who'd a thunk they were so odd? Thanks a billion to Jan Kennedy for finding the pinkster and enriching all of our lives. I'm 99% certain we'll do another of these weekend workshops next July, also featuring a star-studded cast of teachers. You can be assured field trips will also be a lrge part of the operation, and we'll be doing it at some wonderfully biodiverse place such as Killdeer Plains. We'll also be keeping it to few enough people that field trips don't exceed 10 or 12 folks, to maximize the learning and teaching opportunities. Should you be interested in advance notification for next year's workshop, feel free to send me an e-mail at ambrosia@columbus.rr.com and I'll make sure you're entered in the system. Sibley at Midwest Birding Symposium! That's David Sibley, surrounded by woody plants. Dave. Ya know him, ya love him, ya got his book. When it launched in 2000, his Sibley Guide to Birds caused a firestorm in the birding world not seen since Roger Tory slapped down some arrows, pointed them at key field marks, and inked them all into his now legendary field guide. 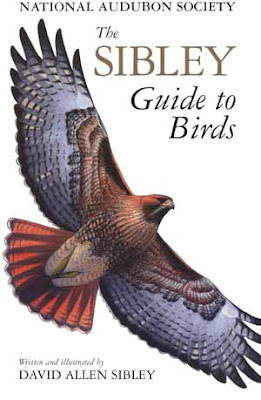 Sibley's guide is now indispensable to birders of all stripes, and is remarkable in its scope. Adorned with a lovely Red-tailed Hawk, the now famous Sibley guide. Many of the people reading this have it, I'll bet, and many reading this have probably consulted their Sibley within the last few days, I'll bet. 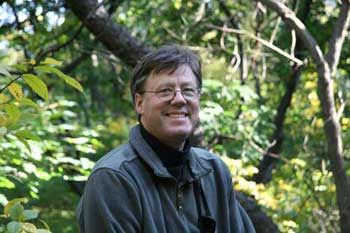 Well, many birds spend much time in trees, and this ecological relationship has not eluded David Sibley. 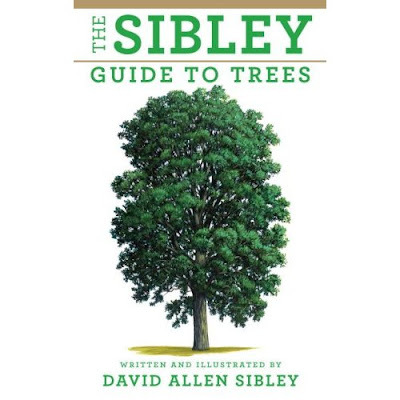 And unbeknownst to many, he has spent the last seven or eight years laboring away on the dendrological counterpart to his bird guide: the Sibley Guide to Trees. And, MAKE NOTE, just a few weeks after the book hits the shelves, David is coming to Ohio and the Midwest Birding Symposium! 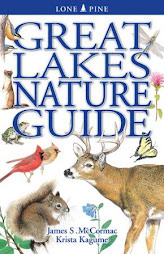 You heard right, Sibley will be on the shores of Lake Erie at MBS giving a program about his new guide, and signing copies. The cover. You'll want this one staring out from your shelf. All birders will do well to learn a bit more about the foliage that our feathered friends frequent, and this'll be the book to have. 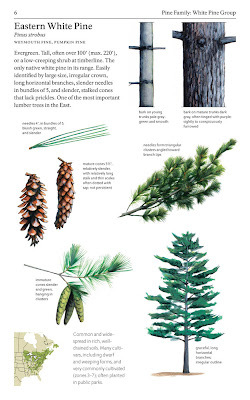 A page from within, this one featuring one of Ohio's four native pines. Like Pine Warblers? They like this tree. 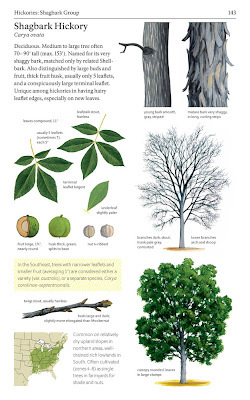 Here's the Shagbark Hickory page. Brown Creepers sometimes build their nests under the exfoliating bark of this woody shagster. Oh yes, the new Sibley will not only be made from wood products, it is going to be chock full of facts about our trees, all attended by Sibley's wonderful, original artwork. Come see David Sibley and get his new book at the Midwest Birding Symposium. The conference dates are September 17 - 20, and Mr. Sibley will be there on Friday the 18th. There will be many other great speakers and birding luminaries. Just check the schedule right here. You'll absolutely not want to miss this event. If you live in Ohio and like birds, I really hope you can make it. 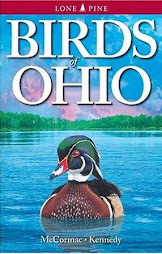 If you don't live in Ohio and like birds, I really hope you'll come visit our state. I GUARANTEE you'll have a great time on the shores of Lake Erie. And no matter where you live, if you DON'T like birds, I really encourage you to come to Midwest Birding Symposium. We'll make some sort of birder out of you or give your money back! REGISTER right here! Hope to see you in September. Gray Petaltail, Tachopteryx thoreyi. This is a humdinger of a dragonfly, sure to inflame the passions of any odonate enthusiast, or send bug-haters into a mad gallop, screaming wildly in terror. Kelley Williams-Sieg and I were driving down a rural lane in backwater Ross County last Sunday, when Kelly tipped me to a big dragon cruising the roadside ditch. "Whoa!" I braked hard, we leapt out, and there it was, this magnificent black and gray beast. In the video above, I talk a bit about petaltail's habitat requirements, which are quite specific. They need sepage outflows of ground water within wooded habitats, a prime reason they are not common and widespread. Found in only 19 of Ohio's 88 counties, and few and far between where they do occur. Had this petaltail been less than a mile down the road, it would have been a Vinton County record. At the end of the video, I also make a behaviorial comment and prediction. And sure enough, with no goading at all, the Gray Petaltail soon roared out to land on his visitors. I stuck my hand out, and it didn't take long before he posed on that. You can see how big this species is, and that coupled with its predilection for alighting on unsuspecting people has, I am sure, sent more than one bugaphobe into conniptions. I don't know why they do this, and I've yet to hear a good explanation for their people fondness. Every one I've seen that had the opportunity has landed on his admirers, even though plenty of other good or better perches were close at hand. And I don't think it's because we're attracting deerflies or other tasty treats that might lure the petaltail. They'll just perch on you, doing nothing, then occasionally dart off and make their regularly scheduled hunting forays, then return to their humanoid perch. What petaltails may lack in showy colors, they more than compensate for with an abundance of charisma. This is a fantastic beast to stumble across, if you are with people who enjoy nature and had no idea that petaltails fly on planet earth. They're almost sure to get a show. Gray Petaltails belong to an extremely primitive group of dragonflies. That face, smiling up from his perch on Kelly's leg, has been around without major changes for a jaw-dropping 250 million years. Here, Kelly models the lovely petaltail, which matches her apparely rather nicely, thinks I. I can envision a future in marketing pet petaltails. These trained dragons would accompany their owners, hanging off various body parts and delighting all whose paths are crossed. For thrills, the petaltail will occasionally dart out and kill large butterflies or dragonflies, as they are fond of doing. Eye level with our petaltail. This is the goshawk of the dragonfly world, and they are a treat to watch. When flight is required, the petaltail lumbers airborn with a whirring of wings, resembling a miniature Sikorsky helicopter. Fast and direct of flight, little escapes their attention, and with quick lunges and darts they efficiently take out nearly any beast their size or smaller that is unlucky enough to happen by. I am certainly not an anti-collector, but this is one insect that should probably not be jugged and shelved if at all possible. Petaltails and their habitat is not frequent, and it might be some time before suitable habitats are found and replenished if petaltails are collected out of a particular spot. Don't add this one to your insect collection, should the opportunity arise. Besides, Gray Petaltails are far more fun to watch in real life than they are pinned to a board in a drawer. While exploring the deep woods of Tar Hollow State Forest the other day, I came across both representatives of one of our more bizarre plant families. Both species are below. Like ghostly skeletal fingers, the aging stems of Indian-pipe, Monotropa uniflora, claw from the humus of a rich woodland. Parasitic, this species and all members of the Monotropaceae lack chlorophyll, giving them this distinctive and decidedly unhealthy look. Although a bit past peak, it is still easy to see how Indian-pipe came by its specific epithet, uniflora: one-flowered. Indian-pipes have devolved the need to produce chlorophyll. They tap into the mycelia of fungi, and uptake nutrients from the vast web of subterranean fungi that underlies everything that we haven't destroyed. The fungi in turn are interrelated with forest trees, once again underlining the expansive and peculiar ecological web that we scarcely understand. I was especially excited to come across this one, the other species in the Indian-pipe family (although some place them in the much larger heath family, Ericaceae). It is Pinesap, Monotropa hypopithys, which is generally far less encountered than is Indian-pipe. To me, it is showier, with a raceme of multiple flowers tinged creamy yellowish. This plant is not yet in full bloom; as it matures the flowers will open a bit more. Pinesap is known from perhaps one-third of Ohio's 88 counties, but it is easy to overlook. Discovery is compunded by the fact that it blooms in the heat of mid-summer, when woods are dim and shady, and full of deer flies and other biting nasties. After successful fertilization, these flowers will become more erect. The specific epithet hypopithys means "under pines" and the common name Pinesap reinforces that this is a plant to seek amongst conifer stands. However, there wasn't a pine to be seen where I found this one, and most that I've seen have been in the acidic dry soil of oak-dominated ridgetops. Like the Indian-pipe, Pinesap requires fungi for fuel. If you find yourself out in the forest, keep an eye out for these oddities. It's time for a bird on this blog, and today's featured feathered creature is a doozy. Of the 38 species of warblers that breed east of the Mississippi, few can compare to the Hooded Warbler in pure pizzaz. I suspect Hoodeds rank high in the overall stats of people's favorite warblers, and with good reason. Today, I had the opportunity to spend about five hours tromping some rugged forested terrain in southeast Ohio with Kelly Williams-Sieg, who is studying several species of forest birds as part of PhD program research at Ohio University. We found plenty of Hooded Warblers, one of her target species. Part of Kelley's work involves close study of foraging birds in an effort to determine energy expenditure as it relates to feeding, so we were watching these gold and black stunners closely, and had some outstanding observations. 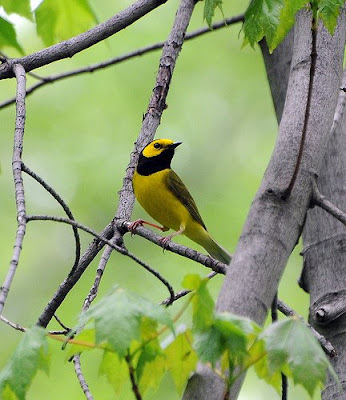 Beautiful male Hooded Warbler, photo courtesy Jim Paris and Flickr. Few birds get birders excited like Hooded Warblers; just watch the crowd reaction at a place like the Magee Marsh Bird Trail if an obliging Hooded makes itself known to the masses. But they are very common breeders in the large forested tracts of the southern Ohio hill Country. We had perhaps a dozen today in a relatively small area, and at one point four males could be heard singing from the same spot. This is prime turf for Hooded Warblers. Rich eastern deciduous forest; mature overstory canopy with dense shrubby understory. The warblers generally stay low, and even though they are often at eye level, Hoodeds are not the easiest birds to spot due to the thick vegetation that they inhabit. Supposedly, they have the largest eyes, proportionately, of any warbler, an adaptation to better see in the perennial gloom of their shady haunts. I made this video of one of our birds from this morning; it shows a male Hooded Warbler strutting his stuff. Note the chronic tail wagging and pumping, a distinctive characteristic of this species. Each time he flicks and fans that tail, the large bold white spots flash like beacons. There's a reason for that; check the next video. In this video, we see a male Hooded Warbler foraging in thick undergrowth. I think of their feeding strategy as a shock and awe style of hunting. Essentially, they are like small feathered bulls in an insect filled china shop, raging about and literally spooking bugs from their hiding spots with their rapid movements and bright tail flashes. Watch an actively feeding Hooded Warbler, and it won't be long before you'll see it make a short sallie out to flycatch a winged insect that it probably spooked from hiding. Such as the moth above, which I also photographed today. I don't know the species and haven't had time to research it, but this moth certainly seems to be some sort of dead leaf mimic. That ploy probably works well, but should our raging yellow bull happen through, I'd about guarantee this moth would flush. And make another meal for the Hooded Warbler.